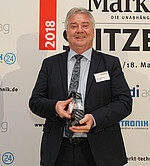 Each year, the editors of ELEKTRONIKPRAXIS, a popular German trade magazine covering electronics management, hardware and software development, component procurement, and electronics production, celebrate the electronics pioneers that are making history with their technological achievements and entrepreneurial merits. In the 2019 edition, the founders of eight companies were recognized for their lifetime accomplishments, and Wibu-Systems won in the Security category. Two criteria were decisive for the selection: outstanding inventions and developments in our field of expertise and the current market significance in our market segment. For the iF DESIGN AWARD 2019, the 67 independent international members of the iF International Forum Design jury have carefully screened 6,400 entries from 50 countries and assigned this prestigious prize to CmStick/B in the Computer category of the Product discipline. CmStick/B is the most elegant, compact, and sturdy hardware secure element of the entire CodeMeter portfolio. It was chosen for its unique innovation, functionality, and aesthetics traits. Immediately following the award ceremony, the unit will go on display for three months at the iF Design Exhibition in Hamburg, Germany, and will be featured in the “Design Excellence” section of the iF WORLD DESIGN GUIDE. VDE Verlag, the German specialist publisher for electrical engineering and information technology, in collaboration with ZVEI, the association representing the economic, technological, and environmental interests of German small to medium-sized enterprises in the electrical industry, and Hannover Messe, the world’s leading industrial technology show, is calling for votes on the Industrie 4.0 Innovation Award. In the first round, all submissions received were reviewed by an independent jury of experts that left only the ten best Industry 4.0 innovations for the public’s scrutiny: CodeMeter is among the top nominees for the secure storage of certificates and keys, also in combination with OPC UA, the protection of software on I4.0 devices, and the encrypted and signed transmission of machine, production, and configuration data. 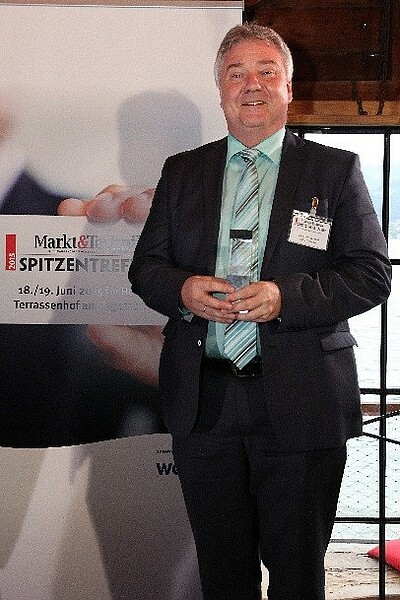 Each year, the readers of Markt&Technik, a highly popular electronics magazine mainly distributed to a German-language audience, are called to elect the Managers of the Year. More than 7,000 readers took part in this year’s poll and appointed the leading executives of our times. Oliver Winzenried was selected among the Pioneers and Innovators category, a choice that matches perfectly with his front-running and forward-looking role in today’s technological landscape. Each year, a jury of industry experts screens the entries for the most ingenious, original, and radical innovations that are transforming embedded hardware, software, and tools. Blurry Box, the avant-garde software protection method with publicly provable security features, was chosen as one of the three nominees for the Software category of the Embedded Award 2018. 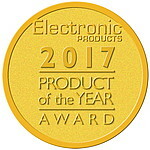 In its 42nd year, the Electronic Products’ “Product of the Year Awards” continue to recognize the best products in the electronics industry. The editors of this prestigious publication have chosen 12 winners from thousands of submissions. The selection was based on a significant advance in technology, innovation in design, or gain in price/performance. Blurry Box has won in the “Development and Software Tools” category showing that the seven different encryption methods included in this new software cryptographic scheme can make code theft more expensive than development. 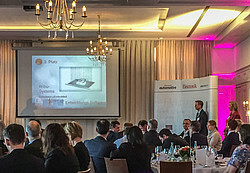 A jury made up of scientists, representatives from VDMA (the German Engineering Federation), members of ZVEI (one of Germany’s major manufacturers’ association), and the editors of the elektro AUTOMATION magazine had already nominated CmStick/BMC as one of the top five nominee products for the Automation Award 2017. The public of SPS IPC Drives 2017 voted on site and ranked our newest secure hardware element third in the Components category. CmStick/BMC represents the quintessential quintessence in engineering and miniaturization, bringing robustness, compactness, and elegance to a level the world had yet to see. The SIIA CODiE Awards are the premier awards for software and information industries, and have been recognizing product excellence for over 30 years. Unprecedently, CodeMeter has received acclaim in two SIIA Business Technology CODiE Awards tiers, winning as the Best Content Rights & Entitlement Solution and being named finalist in the Best Endpoint Management Solution category. This achievement underlines its flexible and agnostic capability to provide top-notch protection mechanisms and enable versatile licensing-based monetization opportunities for software publishers and intelligent device manufacturers. Each year, the Embedded Computing Design team selects the most influential and innovative people in the embedded arena. 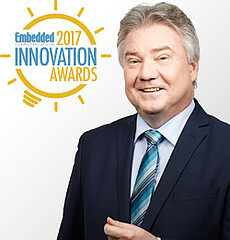 In 2017, Oliver Winzenried, CEO and Founder of Wibu-Systems, has been named one of the Top Embedded Innovators of the year, alongside Kristin Russell, Global President of Arrow Intelligent Systems, and Bill Mensch, CEO and Founder of Western Design Center. In the arms race to secure embedded and IoT systems, Wibu-Systems introduces Blurry Box, a new encryption method based on Kerckhoffs’ Principle that increases complexity exponentially for hackers. CodeMeter µEmbedded, the Wibu-Systems’ CodeMeter variant especially made for software developers to protect application code and intellectual property against reverse engineering on microcontrollers and Field Programmable Gate Arrays, won the third place in the annual Electronic Product of the Year competition led by the German publishing group WEKA. The award ceremony is the final highlight of a selection process in which the editorial team of Elektronik screened all the most recent innovative and forward-looking products and left their readers the final vote among 111 picks. The Alliance Industrie 4.0 of Baden-Wuerttemberg has identified the champions of Industrie 4.0 that are innovating the industrial landscape in the Baden-Wuerttemberg region and supporting the transition of small and medium enterprises into truly connected industry with their ingenious innovations. CodeMeter has been awarded for its technological and monetization value. By promoting security in cyber-physical systems and new business models, Wibu-Systems is establishing its technology as a cornerstone for the advancement of Industrie 4.0. CodeMeter Secure Licensing Platform wins important industry recognition and is named SIIA Business Technology CODiE Award Finalist for Best Content Rights & Entitlement Solution. The acknowledgment is the result of CodeMeter's extreme versatility on multiple fronts that both ISVs and end users can enjoy: the storage of encryption keys on soft, hardware and cloud repositories, online and offline deployment options, flexible license transferability, 24/7 traceability, and support for numerous platforms. 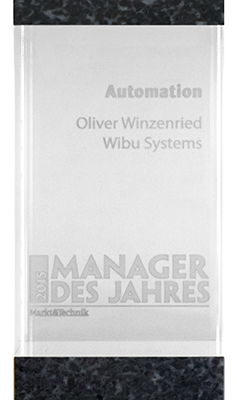 Oliver Winzenried, CEO and founder of Wibu-Systems, has been elected Manager of the Year in the category of Automation. The readers of the weekly newspaper Markt&Technik have cast more than 3,000 votes to select the top managers of 2015. For each of the six categories (Semiconductors, Electro-mechanics, Power Supplies, Embedded Systems, Automation and Measurement Technology), the top three nominees have been awarded. This represents a wonderful show of appreciation for the entrepreneurship of Mr Winzenried’s career. 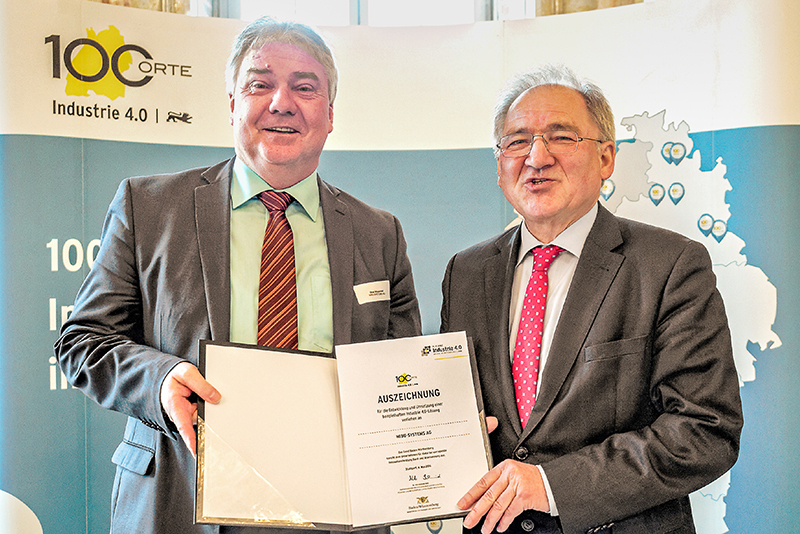 Wibu-Systems, the FZI Research Center, and the Karlsruhe Institute of Technology (KIT) are jointly sharing the honors: the first prize of the high-profile 5th German IT Security Award has been conferred to Blurry Box®, a revolutionary technology based on Kerckhoffs' principles, that is meant to deeply transform the world of cryptography. The endowment of 100,000 euros will serve to develop a sample application and deliver a secure and accurate protection method for testing in a public competition. “Secure Plug and Work” was awarded the Innovation Award NEO2014. 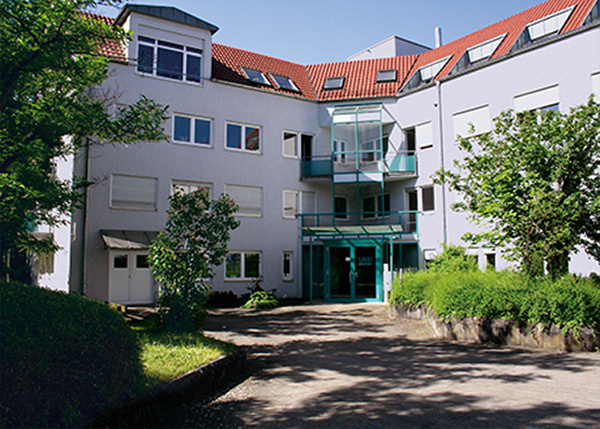 The project is the result of joint development activities of several partners, coordinated by the Fraunhofer Institute of Optronics, System Technologies and Image Exploitation (IOSB). The goal is to develop a practical approach for smart factories, regulated by standardized data communication methods, and implementing safety and security techniques by default. In particular, CodeMeter® is being integrated to preserve data integrity. GIT SECURITY covers safety and security topics, for both the private and the public sector. From manufacturers and distributors to the end user, everybody can stay at the leading edge of progress in management, security, Information Technology, fire protection and safety. CodeMeter from Wibu-Systems was nominated for the GIT SECURITY AWARD 2015 in the Safe Automation category. 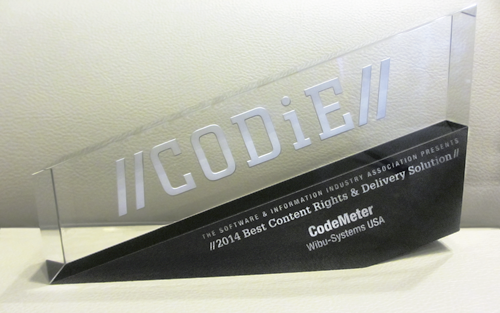 CodeMeter has made its way to the very top and has won the CODiE Awards 2014 for the “Best Content Rights and Delivery Solution” category. This token of recognition underlines 25 years of passion and dedication spent to provide the utmost licensing flexibility and the impenetrable protection no hacker contest could ever break up. With this new breakthrough, CodeMeter is setting the standard for innovation and quality in the media, publishing, information service and embedded markets. During SPS IPC Drives 2012, the jury nominated CodeMeter for the Automation Award. Trade fair visitors were asked to cast their votes for the product or solution they liked best. 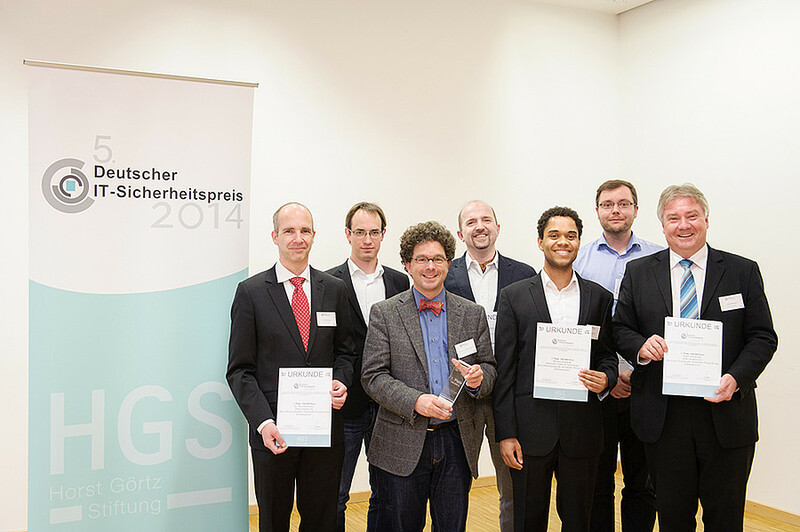 The result: CodeMeter took 4th prize at a ceremony held on 22 January 2013 in Stuttgart. The award CodeMeter received recognizes Wibu-Systems' commitment to the automation industry. CmStick/C Basic has been on the market since the spring of 2011 and is the world’s smallest CodeMeter dongle. Its design has been kept simple: it has minimal dimensions, with its case only exceeding the metal USB connector by a few millimeters. It is intended to be left plugged into the laptop or built into an embedded device. The new CmStick/C with keyring can be attached to any number of keys and easily removed from the USB socket. CmStick/C has the same functionality as other CodeMeter variants based on the smart card chip. The CmStick/C's design also convinced the jury of the Most Successful Design Awards 2011 who awarded it a design prize. 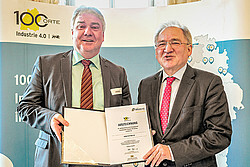 The Karlsruhe-based company Wibu-Systems won the first prize in the Baden-Wuerttemberg Safety Awards 2011. The jury was convinced by its solution, which protects software and know-how against piracy. Oliver Winzenried, CEO and founder of Wibu-Systems, received the "Safety Award 2011" prize and certificate on 24 March 2011 at the Eltefa trade fair in Stuttgart, Germany from the President of the State Office for Constitutional Protection of Baden-Wuerttemberg, Beate Bube. Pro-Protect is a convincing solution which, for the first time, simultaneously protects embedded software, service documentation and production data in industrial machines in a cost-effective and standardized manner. Pro-Protect lets companies focus on their direct revenues, secure in the knowledge their know-how is protected and that they will maintain their competitive edge for longer. Wibu-Systems' various international awards have shown that the company knows how to successfully combine design, function, usability, and innovation. Once again, Wibu-Systems was a finalist in the "Best Digital Rights Management Solution" category of the 2011 CODiE Awards. The prizes were awarded by the international jury of the Software Information Industry Association (SIIA). Wibu-Systems was nominated for the CODiE Award in the "Best Digital Rights Management Solution" category by the international jury of the Software Information Industry Association (SIIA). At the Software Information Industry Association's (SIIA) prestigious awards ceremony, Wibu-Systems was presented the association’s coveted CODiE award for the Best Digital Rights Management System category. Wibu-Systems received the award for developing CodeMeter, known and favored the world over for securing software, documentation, and media and controlling access to Internet-based applications. 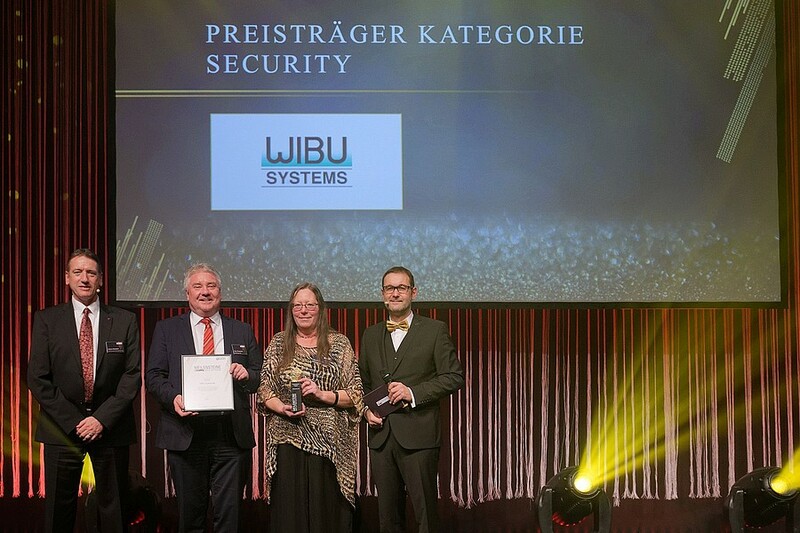 “I am very proud that our products combine two features which are important to our customers: an extremely secure software protection system and an attractive product honored for its design by such a famous magazine as FORTUNE,” said Mr Hado Brockmeyer, Manager of the Chinese office of Wibu-Systems when receiving the award. CodeMeter was once again been singled out by the international jury of the SIIA Codie Awards for 2007 as one of the top-5 products in the "Best Digital Rights Management" category, for which it had already received an award in 2005. As a finalist in this year's awards, once more CodeMeter received this important sign of the industry's recognition and had the chance to be selected as a winner in this category by the members of the Software and Information Industry Association - SIIA. The best products were announced during a gala in San Francisco, USA on 17 April 2007. The German WIBU-SYSTEMS AG as manufacturer of CodeMeter was represented by its American subsidiary WIBU-SYSTEMS USA, Inc. The German dot.NET magazine hosted another installment of its readers' choice award. The readers of dot.NET were asked to choose their favourites from 12 categories and more than 100 products. WibuKey from Wibu-Systems was awarded first prize for the first time in the "Best Tool for Copy Protection" category. For the second time running, Wibu-Systems, a leading manufacturer of hardware based protection solutions for software, documents, access rights, and media, was nominated as a finalist by the international jury of the SIIA Codie Awards 2006 championing CodeMeter in the category "Best Security Software". The final round of nominations included five products from around the world. The members of the Software and Information Industry Association - SIIA voted on the best products, with the winners awarded the "Oscar" of the software industry at a gala event in San Francisco, USA on 16 May 2006. The CmStick/M hardware made by Wibu-Systems was nominated for the 2006 Design Award of the Federal Republic of Germany. This is the only official design award in Germany and is organized by the Federal Minister of Economic Affairs. In February 2006, twenty Silver Awards and five Gold Awards were presented for outstanding products in the areas of product design and communication design in Frankfurt. 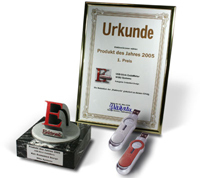 The CmStick USB device was celebrated as "Product of The Year for 2005" in the "Embedded Design" category by the German trade magazine "Elektronik". The magazine's editors nominated a total of 111 products, from which readers chose the top products in each category. CmStick won the prize because of its benefits to both software vendors and users. Software vendors can protect their products reliably against piracy, and users benefit from the various PC security features. The award ceremony took place in Munich, Germany on 13 March 2005. Oliver Winzenried, CEO of Wibu-Systems, had reasons to be pleased: "From nothing to the very top! I am excited that the CmStick has proven to be a favorite right from the start and that the voters, both software vendors and users, are convinced by its security functions. The insides of a CmStick are particularly special: an extra chip-size-package was developed for two chips in which a smart card chip and a fast USB 2.0 controller are piggybacked together. This method alone can combine security with mass storage in the smallest possible area." 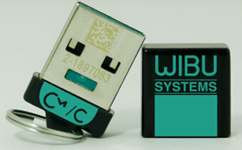 The CmStick/M USB device, developed by Wibu-Systems, won the coveted international "iF product design award" at CeBIT 2005. There were no fewer than 2322 applicants for the popular design award, which was presented to 542 products in 18 different categories. The CmStick/M went on display with the other winners as part of the iF Exhibition at the Hanover Exhibition Center in Germany from March 10 to September 2005. Wibu-Systems was immediately selected among the finalists in its first year of participating in the SIIA CODiE Awards. This year's competition marked the twentieth anniversary for the CODiEs and was hosted by the American Software and Information Industry Association - SIIA to celebrate the world's best products and services in the software industry. CodeMeter was nominated in the category "Best Digital Rights Management Solution: Software". The final round saw Wibu-Systems as the only European and German company competing against four American companies. At CeBIT Asia 2004, the USB hardware CmStick received an award in the "Communication" category. 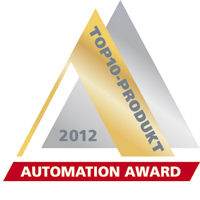 Wibu-Systems is the only German company to win an award in this category. 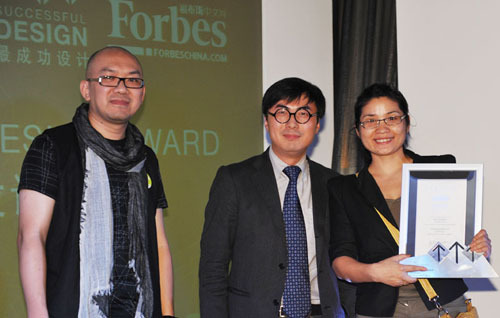 The "China Computer World" magazine awarded a prize to Wibu-Systems in recognition of the high quality of their software protection solution, WibuKey. The award was given in the "Best Chosen for the Software Protection System" category in response to the hackers' contests staged in China over the previous two years. No hacker succeeded in cracking a sample program.